Looking for a new fabric scrap project? 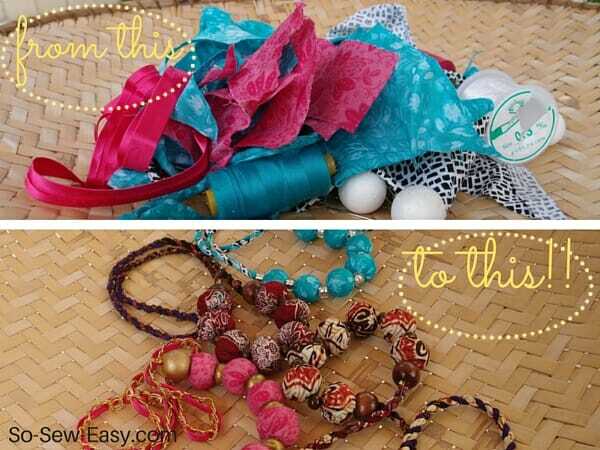 Why not make some fabric covered beaded necklaces. Yes, I hear you!!! What to do with this enormous amount of fabric scraps left over from all the sewing that you have been doing? Too beautiful and expensive to throw away, not to mention, it's money going down the drain. Too ugly to give to a friend, yet you know this pile of mangled fabric is still useful. These beaded fabric covered necklaces are the perfect gift for a friend as a Thank you, birthday or Valentines Day present, and I will show you two techniques to cover the beads with fabric. 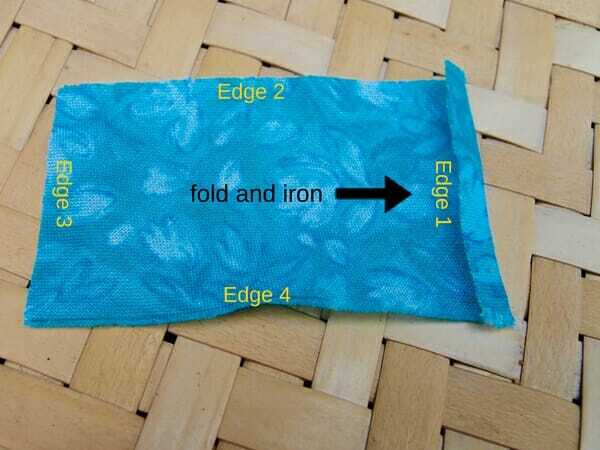 Start with one of your rectangles, fold one of the smaller sides and iron. 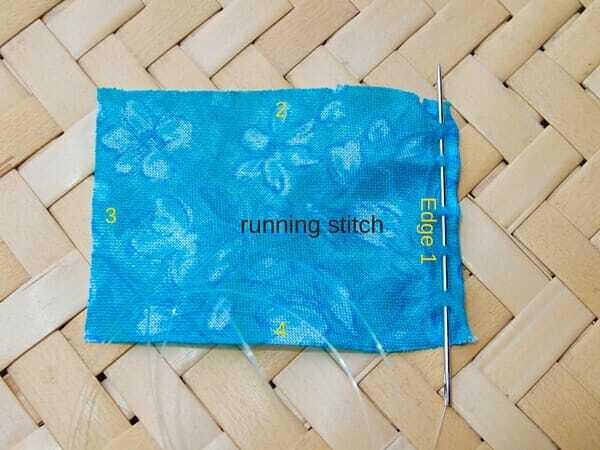 Make a running stitch on the folded edge and secure it by using a backstitch at the end so it doesn't gather. The narrow ends of your rectangle should not gather. Gather the end of the rectangle by pulling the thread. This is the longer side of the rectangle. Hand stitch as you did at the beginning securing the end with a backstitch. 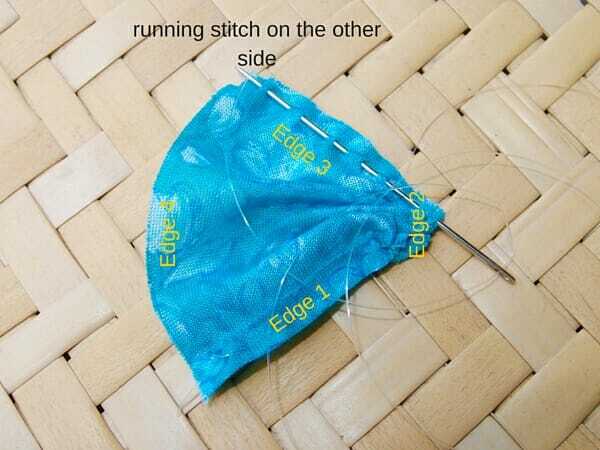 Make a running stitch once again on the other side. Gather the end, the rectangle should look like a piece of candy wrapper. 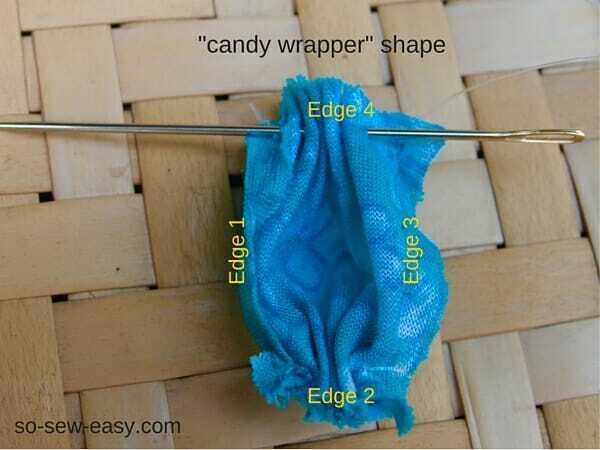 Place the bead inside with the hole to the gather ends, wrap the bead with the raw edge under the folded edge. 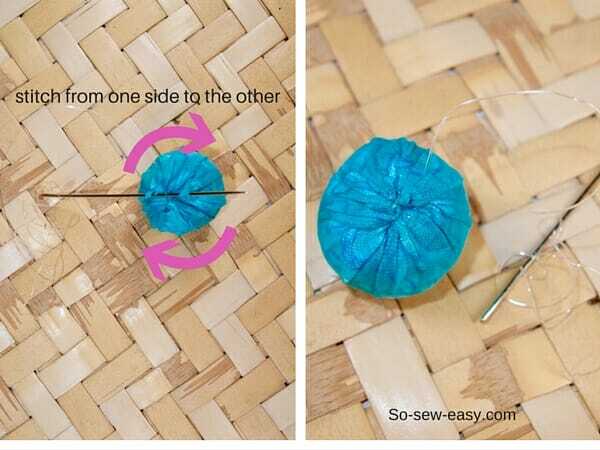 Make a stitch and pass the needle to the other side of the bead through the large hole. 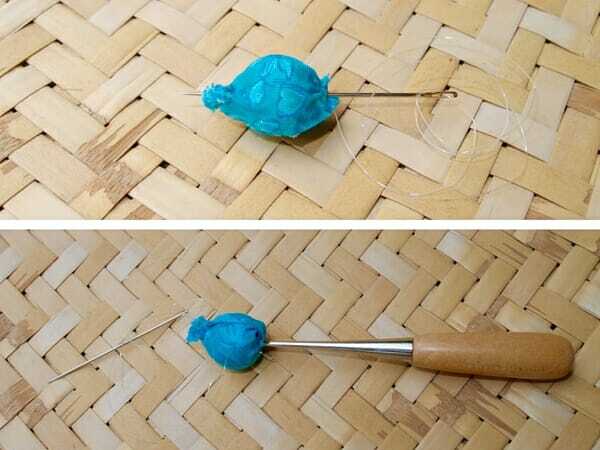 Use your tailor's awl to push the fabric inside the bead. Make another stitch and pass it again to the other side. 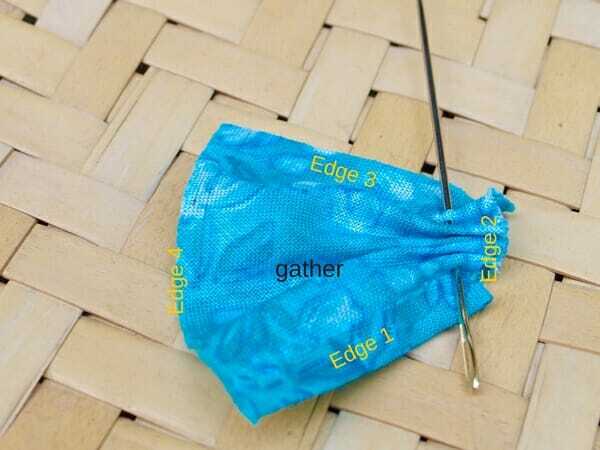 Use your awl shape push the fabric inside the bead hole and shape your bead. Secure the thread the thread with a couple of back stitches and cut. Continue this process until you have the number of fabric covered beads that you need for the necklace. To make the rest of the necklace, and to use more of your fabric scraps, we are going to make a pair of contrasting cords. 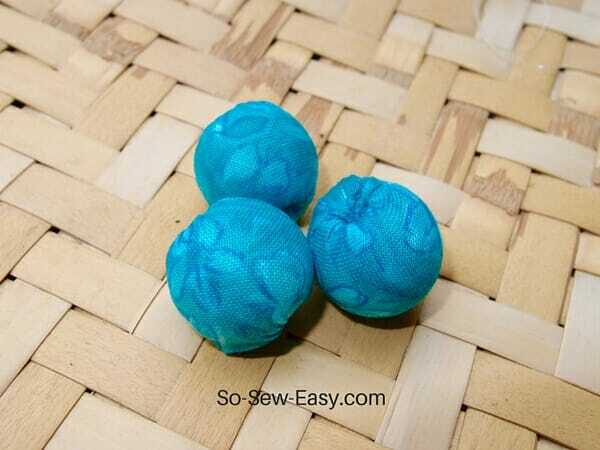 You can use any color you want or in the same color as the fabric you are using for the beads. Cut 2 strips of cloth on a bias of approximately 20 inches in length. With the right side (printed side) together, fold the strip in the middle, iron and then stitch it using your sewing machine. Using your loop turner, turn the strip inside out so now it will resemble a cord. You will need two or three depending on your design and based on the size of the hole in the bead. You might decide to have several contrasting colors. Pin these two cords to a board and twist them around, make a couple of stitches at the end so the cords don't come undone, apply glue to the end to secure it well. 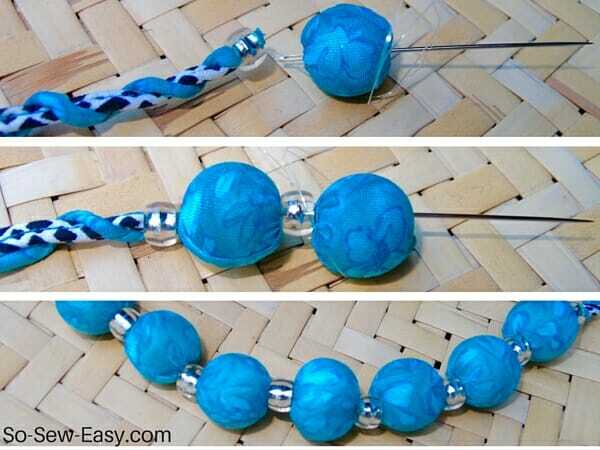 Pass the needle through a contrasting bead, then through one of the wrapped beads. Continue to pass the needle to all the beads, alternating a contrasting bead with the fabric wrapped bead. When you get to the last wrap bead make a knot, apply glue to the cord, pass the needle through the cord, then through a contrasting bead. 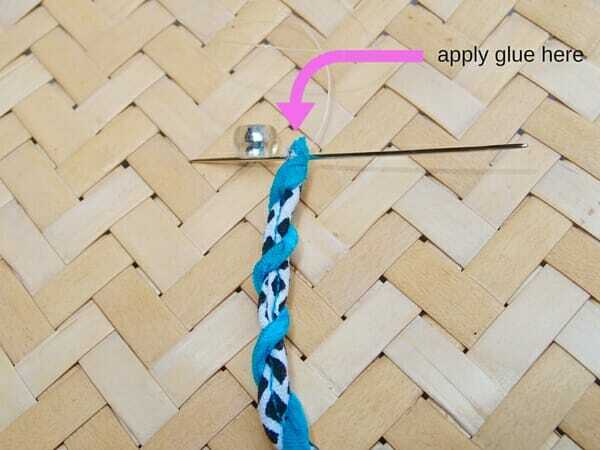 Glue between the contrasting bead and the fabric wrap bead and pass the needle through all of the necklace again. 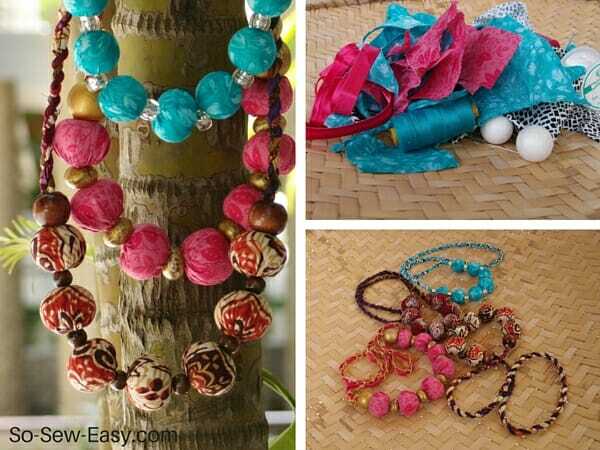 The following technique is for lighter and softer beads, you can turn a few 1″ styrofoam balls, or any size bead and amount of balls according to your design into this wonderful fabric covered beaded necklaces. The materials are the same as above, except the technique varies a bit and may be a little easier. But, believe me after seven beads you will be making a few necklaces in an afternoon while watching your kids play. Let's begin! 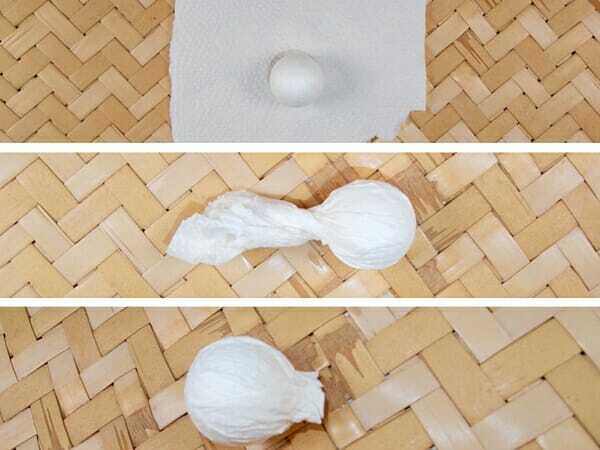 Use a square of a soft tissue or paper towel. Wrap it around the bead, crunching the top into a stomp. Cut off the top leaving no more than one quarter of an inch. Unwrap the paper and cut out it out so it resembles a circle. 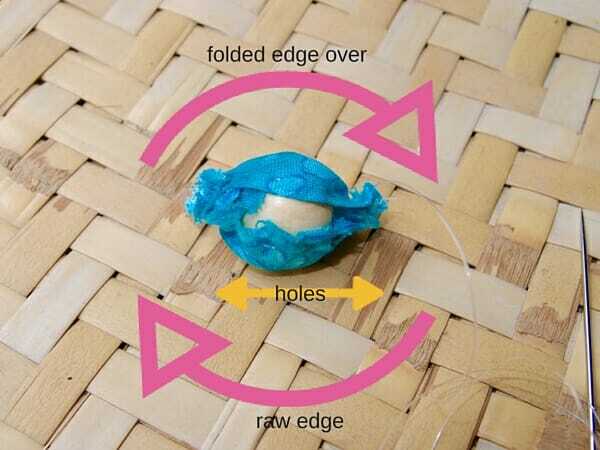 Use this circle to cut the fabric. 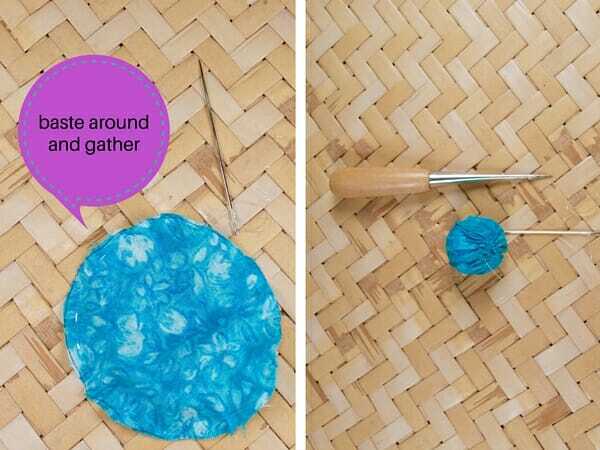 Baste and gather around the circle, place your bead and with your awl, make a hole in the middle of the beads and push your fabric in the hole gently. 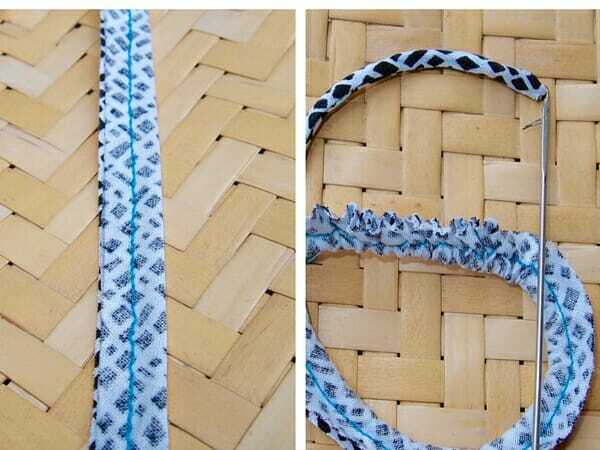 Take out your large needle and nylon thread or quilting thread and make a stitch from one side of the opening to the other, where you pushed the fabric in, you are shaping the bead as to tighten the top. Squeeze your beads to see where the fabric sags then apply a stitch always from one side of the opening to the other until you are satisfied with the shape of your bead. And there you have it! I have enjoyed showing you how to make this fabric covered beaded necklaces project, and I hope it will make a wonderful add to your Etsy shop or to your wardrobe. Please let us know what you think in the comments below and don't forget to post your creations on Pinterest or Facebook! What do you do about the ends? Is there a clasp or do you make it long enough to go over your head? If so, How are the two ends connected? Hi Kathy it is long enough to go over your head. I will add more details on how to finish the necklace but basically you just continue to sew the beads through the hole until you do not see the thread outside the beads. I think this is great. Got a similar necklace at a thrift shop and I get so many compliments on it that it will be great to be able to make another. Thanks you sew much! You are welcome! I actually learn to make this from a lady in a village in Cameroon so many moons ago. She used cotton and scraps of fabric instead of beads. Do the fabric strips absolutely need to be on the bias? I have a lot of small pieces that are cut more or less on grain and am wondering what would happen (any problems?) if I were to try using them. If they are big enough and you are experienced at hand sewing I think you can do it. The pieces only need to be large enough to cover the beads. I do them on a bias because as I sew, I find it easy to pull and shape all the lumps off, being on a bias the fabric can be stretched. Let me know how you went, I am curious. Great way to use up small scraps of fabric. I’ve featured your fab tutorial today, Deby. Thank you Pam, I am happy you liked it!!! My jaw dropped, soooo gorgeous!